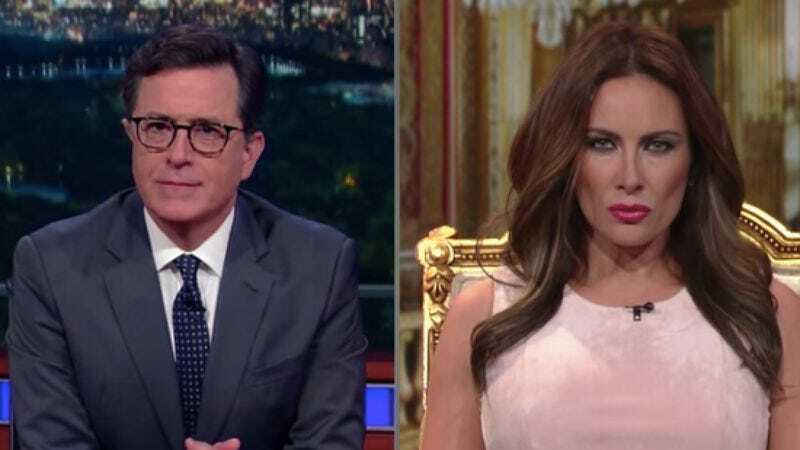 Melania Trump’s recent interviews regarding Donald Trump’s “locker room talk”—otherwise known as his endorsement of sexual assault—opened the door for actress Laura Benanti to return to Stephen Colbert’s The Late Show and give her impression another whirl. The Tony-winning actress plays the former model as a pouting hostage/master of contouring, trying to pass her husband’s comments off as just things boys say, despite the fact that the “boys” in this situation happen to be very adult men. At least now we know what Melania’s rendition of “Bad Boys” would sound like, though we kindly request a full version from Benanti, who is an excellent singer. Benanti’s grimace indicates her Melania is only pretending to be chill with Donald’s antics, as she explains she was previously unaware that when “American men gather to sport they alway brag of grabbing women by the Billy Bush.” Melania’s apparently got a lot to learn about American customs. During the segment, Colbert informs her that, yes, women can run for president in the country, and her husband’s opponent is indeed female. Now that yields a crisis of conscience.